Google has finally made official the much-leaked Pixel 3 and Pixel 3 XL smartphones. As feared, the Pixel 3 XL features a deep and ugly notch that houses a front firing speaker, sensors as well as two front-facing cameras – one for selfies and one for groupies. Despite offering similar capabilities, the smaller Pixel 3 doesn’t have a notch; although Google tried its best to incorporate the controversial design element in it as well. According to Daniel Bader from Android Central, Google’s product designers were keen on adding a notch to the smaller Pixel 3 as well, because customers want more screen real estate and a notch is currently considered the best way to achieve it. However, it was unable to engineer a notch into the design because of constraints caused by the narrower hardware which didn’t simultaneously allow for a notched display as well as a speaker and cameras. As a result, it is the least controversial of the two new Pixel 3 designs. This gives Google Pixel customers an interesting choice this year. Go for the bigger screen and embrace the “it’s more screen, not a chunk missing from your display” argument, or opt for the smaller, but more conventional device. At least the Pixel 3 still offers a generous 5.5-inch display size, so users aren’t necessarily sacrificing too much in going down a size if the notch on the Pixel 3 XL is too much of an eye-sore to overcome. 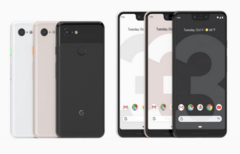 It will be interesting to see which of the two new Pixel 3 designs proves to be the most popular with customers, and what that will mean for the design of future Pixel smartphones from Google.